In observance of National Coming-Out Month (October), API Equality LA hosted an immigrant parent panel on Oct. 8th during their general meeting. Facilitated by Marshall Wong, SGV API PFLAG moms, Carol Mannion (Filipina-American) and Minsook Brady (Korean-American) shared their stories from an immigrant mom's perspective of when their sons came out. ​Held at the Hatekayama Gallery in Downtown, Los Angeles, the Malaya Project presented their first public exhibit on Oct. 10, 2013. Denny Tuazon (photographer) and Gregory Pacificar (filmmaker), Filipino-Americans, collaborated with Fil-Am Arts and Barangay LA. The Malaya Project is ongoing photography series highlighting and documenting the lives of Filipino-American LGBTQ. 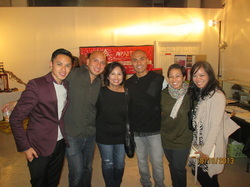 Filipino-American mom, Carol (of SGV API PFLAG) came to support her Filipino/a "sons and daughters". ​The "Welcome Home" Third Annual Fall LGBTQ Resource Fair at the University of CA, Los Angeles (UCLA) campus was attended by our dedicated Harold (Kameya). The event was on Oct. 11, 2013, which was also National Coming Out Day. There were free food, drinks, and giveaways. The goal of this resource fair was to help increse visibility of the more than 20 LGBTA student organizations, the LGBT Campus Resource Center, and many other campus and community resources. Over 400 people came. Harold tabled with Adrian Songcuan, of Barangay LA. We thank Harold and Adrian for reaching out to our API LGBTQ individuals and their families! The 6th Annual Asian and Pacific Islander American Public Affairs Association (APAPA) held their Youth Leadership Conference on Oct. 19th at Diamond Bar High School, CA. Alongside API youth were API leaders in civic affairs, community organizations, and API public officials (Judy Chu, Mike Eng, Ted Lieu, Howard Wang, Jack Tanaka, Ed Chow). We sincerely thank Mr. Kevin Tamaki who invited SGV API PFLAG to this event. Carol Mannion and Marsha Aizumi were present to let our API leaders know about SGV API PFLAG. The 21st Anniversary Models of Pride (MOP) Conference was held on Saturday, October 19, 2013 on the campus of the University of Southern California. It is presented by the L.A. Gay & Lesbian Center’s LifeWorks program. This free one-day conference focuses on the concerns and interests of Lesbian, Gay, Bisexual, Transgender and Questioning (LGBTQ) youth up to age 24, and their allies. This year’s conference is themed “Coming of Age”. The Models of Pride conference offers over 100 workshops, a huge resource fair, exciting entertainment, lunch and dinner, and an evening dance with DJ. The workshops cover many areas of life that are experienced by LGBT youth transitioning to adulthood including but not limited to LGBT issues. They include “tracks” for teens, older youth, transgender youth, and foster youth. There are also a Professionals Track and a Parents Track (we expect 100 parents this year!). For the first time, MOP offers workshops for Gay Straight Alliance (GSA) advisors and other LGBT youth serving professionals who bring their students/clients to the Conference. A Hospitality Suite will be available to them during the day where they can relax, find resources and network with colleagues. The Resource Fair has three areas: Service Organizations, Colleges and Universities (recruiting LGBT youth) and Businesses (offering job opportunities and internships). For our SGV API PFLAGers, Eric coordinated the resource table with volunteers, Clara K., Harold & Ellen, and Viet-ROCers, Joee and Hieu. Harold and Ellen Kameya also participated in a workshop panel by API Equality LA, "Coming Out for Asian Pacific Islanders", to share the parent perspective. Of SGV API PFLAG, parents Carol Mannion, Marsha Aizumi, Harold and Ellen Kameya contributed their personal stories about when their child came out. Q&A Space began as a story collection project during Hertz Alegrio's and Shelly Chen's internship at API Equality-LA in the summer of 2012. 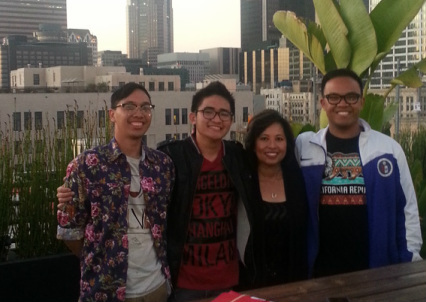 Since then, in an effort to create more accessible, culturally relevant resources for the Asian Pacific Islander (API) LGBT community (especially youth), API Equality-LA has been working to develop the project into a “Coming Out Website” specifically designed for those who identify as API and LGBT. Q&A Space is the first website of its kind, with in-language fact sheets for parents, community resources for youth, multi-media advice and stories from the API LGBT community, and more. ​The 2013 PFLAG National Convention theme is: "One Voice Can Change The World: Honor the Legacy, Inspire the Future". The convention was held in Washington DC's Marriott Mayflower Renaissance Hotel fOct. 24-27. 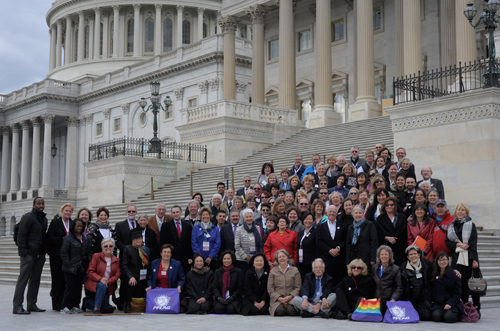 The conference included Lobby Day on Oct. 24, over 40 workshops delivered by PFLAG chapters across the nation, an awards dinner, and 3 plenary sessions. Representing SGV API PFLAG at the convention was Marsha Aizumi and Carol Mannion. We thank PFLAG-Pasadena for helping make our chapter's representation possible! A panel/workshop on "Establishing and Maintaining Culturally-Inclusive and Specific Spaces" was presented by Marsha Aizumi, Carol Mannion, Clara Yoon (API Project/PFLAG NYC), and Ben de Guzman (NQAPIA) on Oct. 27th.